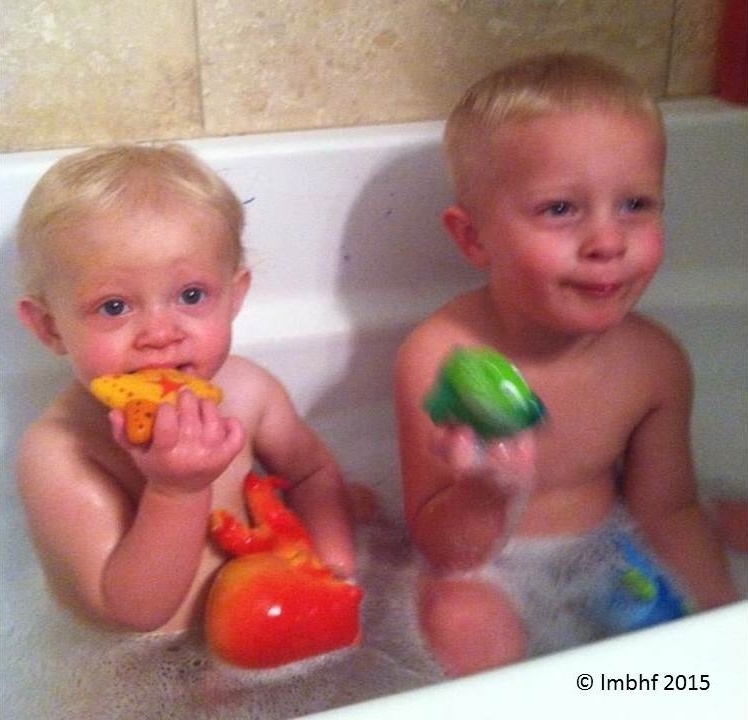 April 17, 2015|Posted in: Happy, Healthy, Smart Kids! This is G2 taking a bath in a bucket while my batroom was being remodeled! Swoosh, Splish, Trickle, Drip, SPLASH! Almost all kids love bath time. I suspect most of those who don’t, have parents who are doing it wrong! Even when you’re in a hurry, bathtime can be fun. It doesn’t need to take a long time (though I’ve had many a kid protest getting out of the tub when they had already played so long they’d nearly turned into a prune!). But, most of the time you should allow kids a few minutes to play at bathtime. 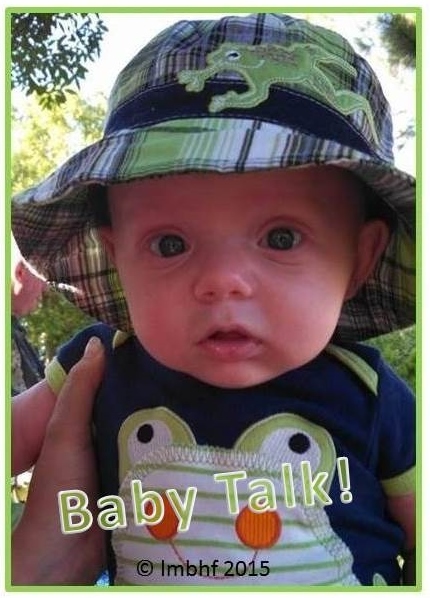 All my kids and grandkids started splashing and cooing in the bathtub when they were just a few weeks old! We always make bathtime a happy, playful and social time. 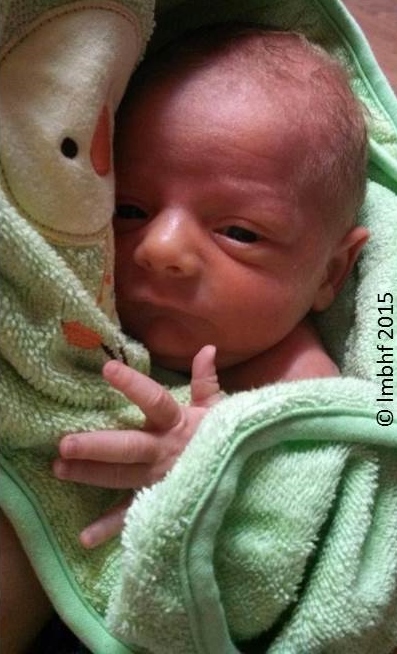 I always enjoyed giving my kids a bath and now I’m using it to bond with my grandkids too! 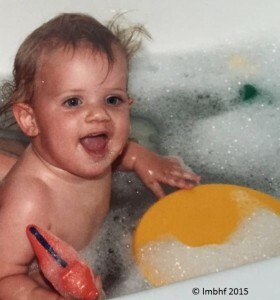 This is my youngest daughter Tarrin (now grown) with a puzzle boat, a squirt gun and bubble bath! 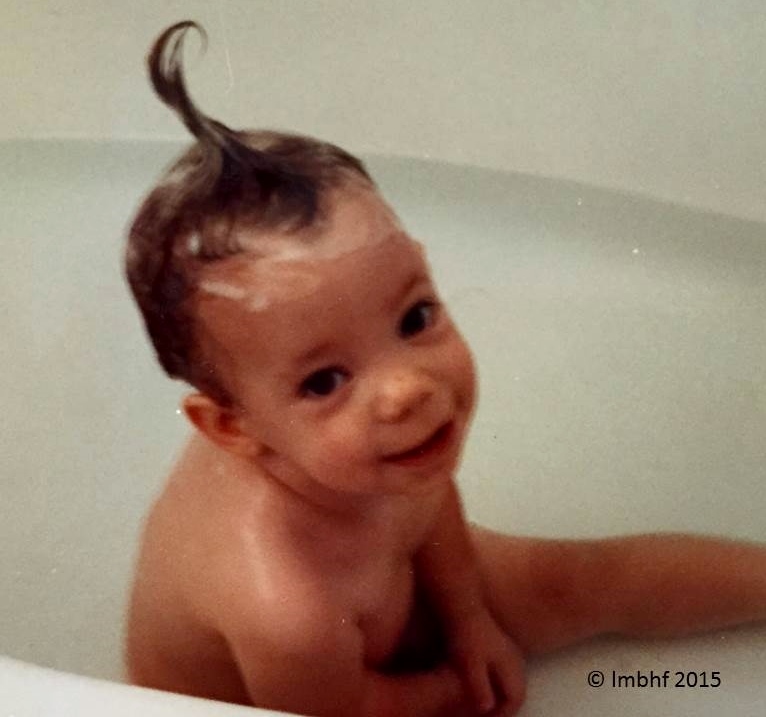 This is my oldest daughter Hillori (Now grown) playing the silly hairdo game with shampoo! Start the water and check the temperature (around 98 degrees is great!). As soon as the tub has enough water to keep them warm, put the kids in and let them play as it fills. For the tiny ones make sure you use a seat or pad of some kind to hold them up in the water. When the tub is full, turn off the water and let the fun continue. 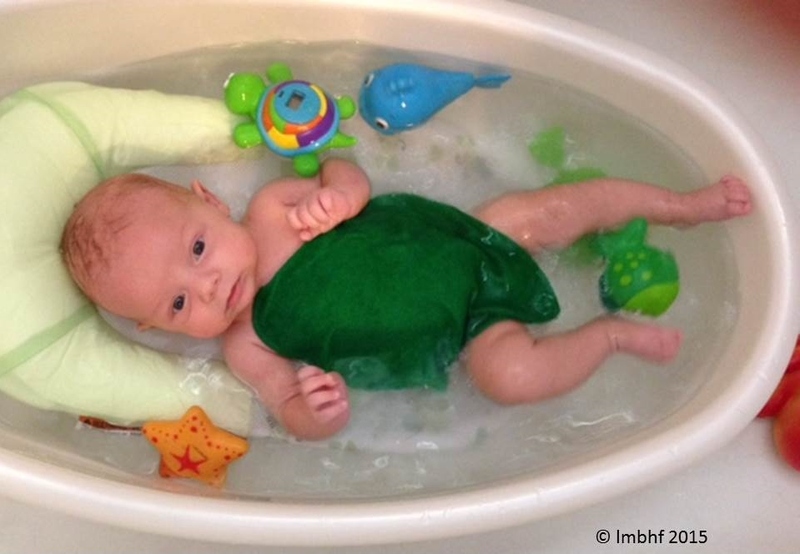 With our tiny ones we squeeze washcloths of warm water over them and talk to the baby about how good it feels, or laugh with them as they begin to learn to kick and splash. As they get older we play with toys, make up stories and games and just have fun! Give the kids a few minutes notice that it will soon be time to get washed up and get out of the bathtub. Wash up the tiny ones or supervise kids washing up themselves as they get older and can take on some or all of the responsibility for themselves. Make sure you use “no tears” soap made especially for kids and take care not to get water in their eyes cause that’s sure to ruin bath time. Get them out, wrap them in a snuggly towel to dry off, dry and clean their ears, and comb or brush their hair. Dress them, or help them get dressed, in nice clean clothes or pajamas. This is G3 and G1 having fun playing with toy fish! Put color tablets in the water to turn it pretty colors. Color on the tub walls with bath crayons. Wet foam letters and shapes with water and stick them to the bathtub wall. Float colorful boats in the water. Use a plastic pole to catch colorful fish. Squirt water with toys or squirt guns. Pour the water into plastic cups, pitchers, and funnels. Make funny hairdos with shampoo. Don’t forget a mirror so the kids can see themselves! Use bubble bath or bath fizzies. Take baby dolls in the tub and let the kids give them a bath. Here’s G4 at just a few weeks old and he already has toys in his bath! You’ll love these related products from Amazon. Click on the photo or the description and you’ll be redirected to Amazon where you can purchase the products. It’s a great way to build happy childhood memories! « This Makes It All Worthwhile!